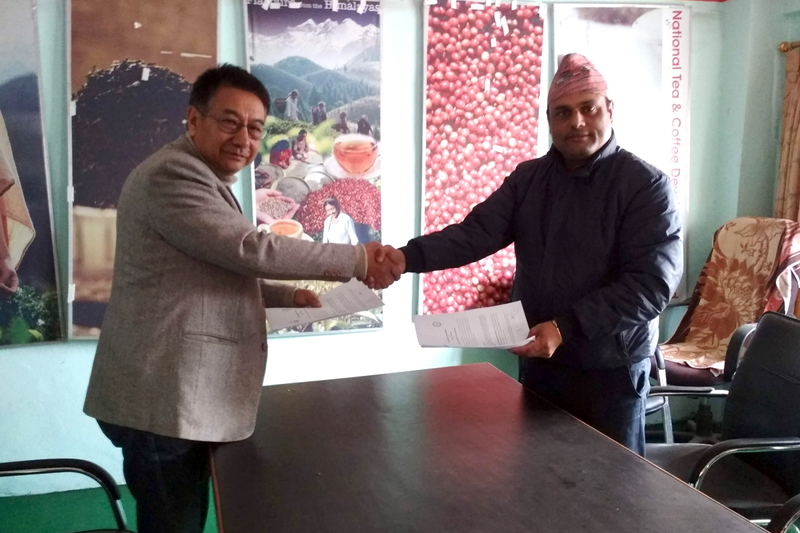 A Memorandum of Understanding (MOU) is signed between Beautiful Coffee Nepal (BeaCoN) and NTCDB. Beautiful Coffee Nepal in partnership with Good Neighbors International Nepal is implementing “Coffee Value Chain Development Project” under “European Union support to the Competitiveness of Quality Coffee in Nepal” for the establishment and sustainable operation of a coffee cupping lab. According to the MoU, the cupping lab shall remain under the custody of NTCDB and placed at its regional office in Pokhara, Kaski. Coffee cupping is a new concept in Nepal. Quality of coffee is determined by the size and color of coffee sample. Alhough there have been few coffee cupping trainings in Nepal in the past, cupping is not regularly done by coffee roaster due to lack of necessary facilities for cupping. Stakeholders involved in coffee production, processing and marketing need to know/ensure the quality of coffee being handled, which is done by the process of cup testing. For the initial establishment of cupping lab, BeaCoN shall provide technical and materials support to NTCDB, while, NTCDB ensures the sustainable operation of the cupping lab.